There are 19 Assisted Living Facilities in the Venice area, with 16 in Venice and 3 nearby. The average cost of assisted living in Venice is $3,285 per month. This is lower than the national median of $3,346. Cheaper nearby regions include Nokomis with an average starting cost of $2,200. To help you with your search, browse the 150 reviews below for assisted living facilities in Venice. On average, consumers rate assisted living in Venice 4.1 out of 5 stars. Better rated regions include Nokomis with an average rating of 4.8 out of 5 stars. Caring.com has helped 22 families in Venice find high-quality senior care. To speak with one of our Family Advisors about assisted living options and costs in Venice, call (855) 863-8283. Harbor Inn Of Venice Inc.
Palmetto Court Alf Of Venice Inc.
Venice, Florida is named for the famous Italian city and fashioned after it with northern Italian architecture. While the Floridian city is not situated between canals like its namesake, it is located on the Gulf Coast of Florida, south of Sarasota, and boasts white sand beaches. Retirees will be in good company here since nearly 60 percent of the population in Venice are age 65 and over. There are 18 assisted living facilities within the Venice city limits and another 22 in nearby areas such as Nokomis, Englewood and North Port. Florida's Bureau of Health Facility Regulation licenses assisted living facilities in Venice and throughout the state. There are several types of AL facilities to consider, yet all facilities provide meals. The cost of living in Venice is 9 percent higher than the national average. Health care costs are also higher, as is housing. Seniors who need to stick to a budget may find more affordable living in Venice Gardens, South Venice or North Port. Venice is a relatively safe city. With 1.16 reports of violent crime per 1,000 residents per year, the city's crime rate is less than half the state and national averages. Expect significant annual rainfall in Venice as the long, humid summers are frequently punctuated with thunderstorms and heavy downpours. Average high temps reach the 80s and low 90s during most of the year, and the winter lows drop to the mid-50s. There's a 7 percent sales tax on most purchases in Venice, but Florida doesn't have a state income tax, and that includes SSI benefits and pensions. There are also no inheritance or estate taxes in the state. Sarasota County, home to Venice, is a member of the AARP Network of Age-Friendly Communities, meaning its elected leadership "has made the commitment to actively work toward making their town, city or county a great place for people of all ages," according to AARP. The American Lung Association grades Sarasota County as an A for particle pollutants and a B for high-ozone days. Seniors with breathing difficulties shouldn't experience worsening symptoms due to Venice's air quality. Assisted Living costs in Venice start around $3,657 per month on average, while the nationwide average cost of assisted living is $4,000 per month, according to the latest figures from Genworth’s Cost of Care Survey. It’s important to note that assisted living rates in Venice and the surrounding suburbs can vary widely based on factors such as location, the level of care needed, apartment size and the types of amenities offered at each community. 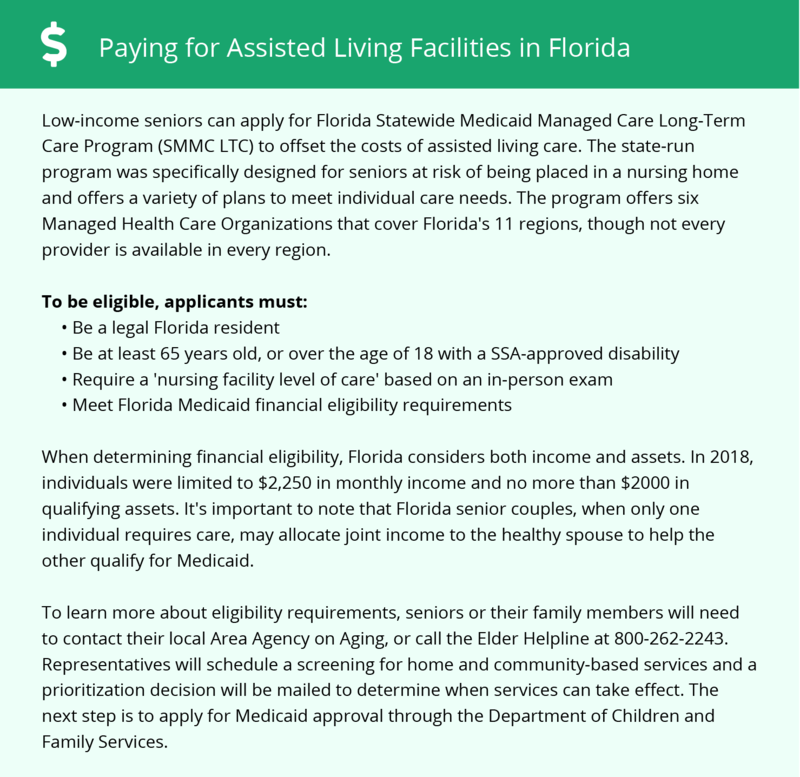 Florida has two programs, Medicaid Long-Term Care and Assistive Care Services, that can pay for services at an assisted living facility. The plans don't cover room and board, but the state does let families contribute to those costs without impacting Medicaid benefits or eligibility. Florida also provides optional state supplementation for people receiving Federal SSI benefits. Venice and the surrounding area are home to numerous government agencies and non-profit organizations offering help for seniors searching for or currently residing in an assisted living community. These organizations can also provide assistance in a number of other eldercare services such as geriatric care management, elder law advice, estate planning, finding home care and health and wellness programs. To see a list of free assisted living resources in Venice, please visit our Assisted Living in Florida page. Venice-area assisted living communities must adhere to the comprehensive set of state laws and regulations that all assisted living communities in Florida are required to follow. Visit our Assisted Living in Florida page for more information about these laws.